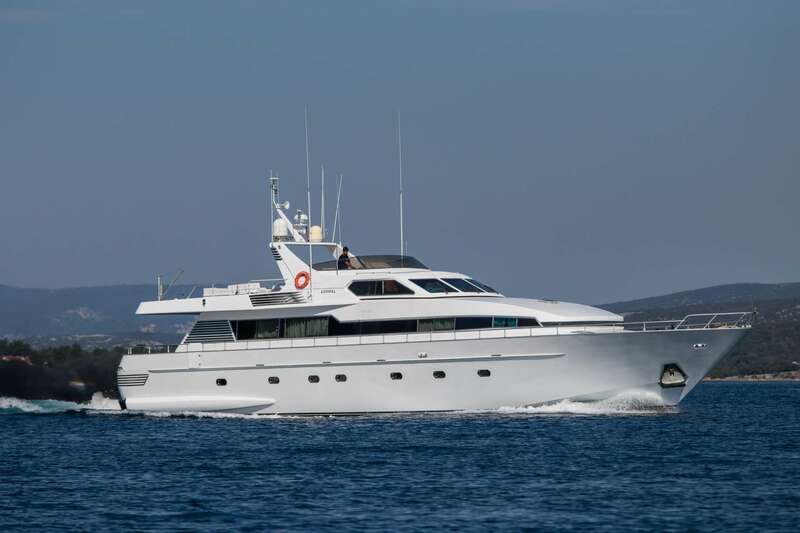 27m/87ft motor yacht BORA BORA II was constructed by Admiral in 1992 with an aluminium hull and superstructure. 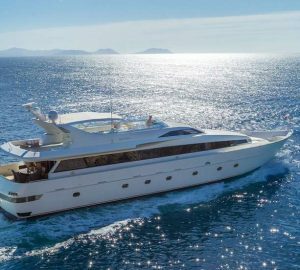 Last refitted in 2017, this semi-displacement superyacht offers all the modern conveniences in a classically styled environment for enjoyable luxury charter vacations. 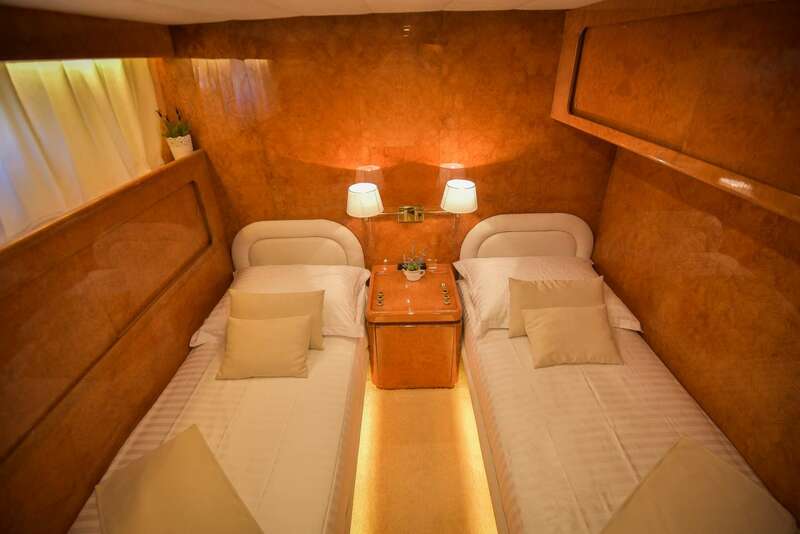 The accommodation provides four en-suite cabins for up to eight guests. The aft section of the main deck is fully enclosed and creates a safe environment for families with younger children. A soft sofa, additional chairs and a table create an informal dining area in the shade of the cockpit. 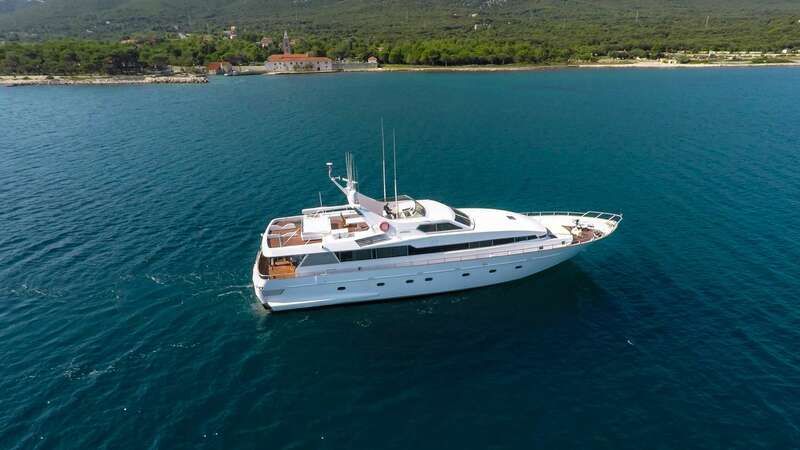 Sunpads are located on the bow in front of the helm station and create a secluded spot for guests to rest in the sunshine. On the flybridge, the aft section is reserved for the tender and the central section hosts a broad sun pad and a forward table for casual alfresco dining. 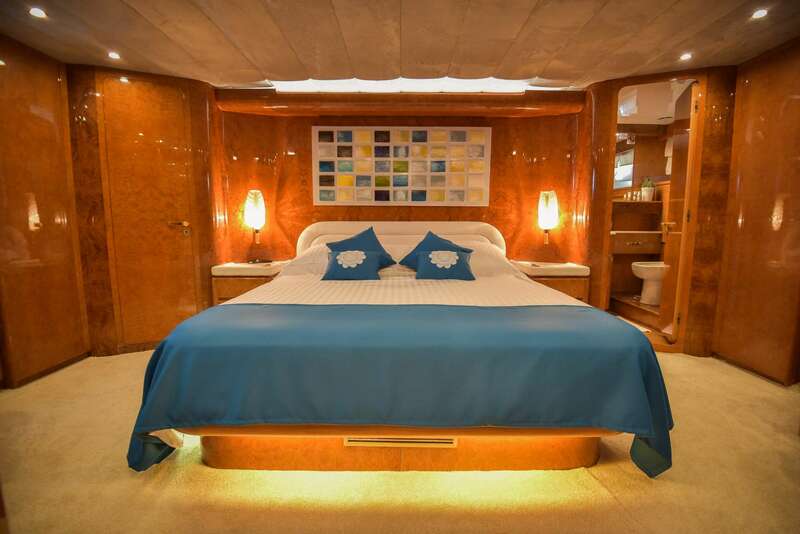 The lower deck layout contains the engine room, crew cabins and guest accommodation, which consists of a spacious Master suite, a VIP stateroom and two twin cabins, all with en-suite facilities. 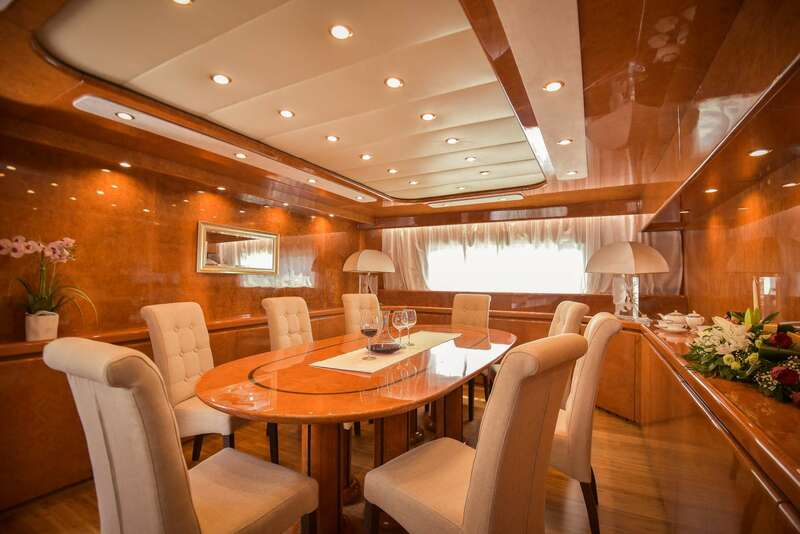 On the main deck, there is a forward formal dining area closed off from the main salon for more intimate meals between eight guests. There is plenty of ceiling lighting for late evening meals, and table lamps can be used to adjust the ambience to suit the occasion. The main salon to the aft creates a clean and bright environment using off-white and cream coloured furnishings with blue accents against light wooden panelling. 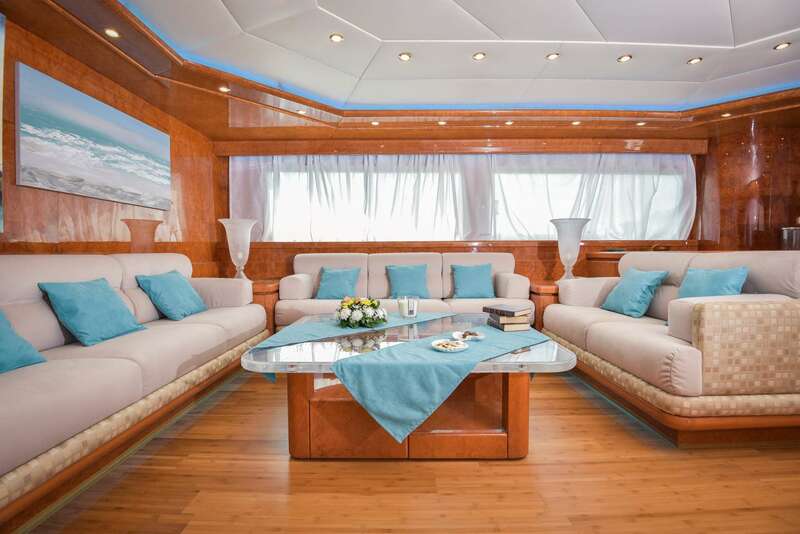 Three sofas face into a coffee table on the starboard side and a bar is available close to the aft sliding doors. Wide windows run along both sides for great views and natural lighting throughout the day. Twin MTU 12V 396 1610 KW engines produce a top speed of 20 knots. 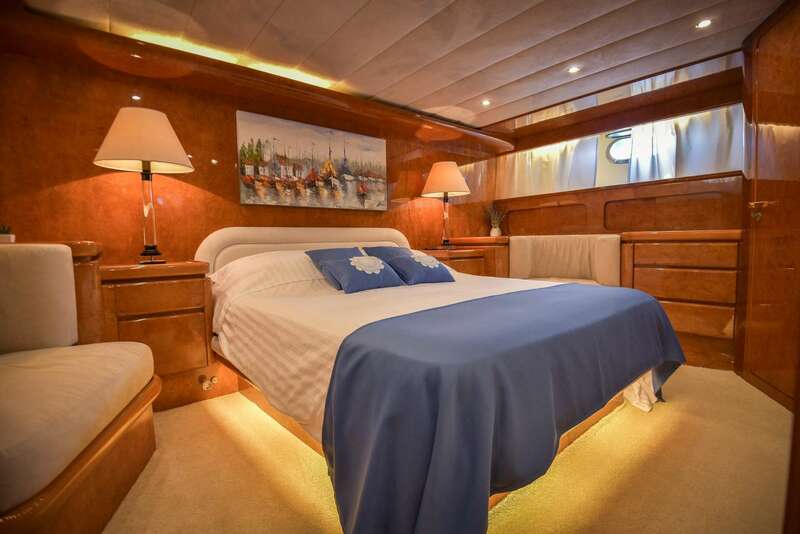 The accommodation provides for up to 8 charter guests over 4 comfortable en-suite cabins: 1 Master suite, 1 VIP stateroom and 2 twin cabins. 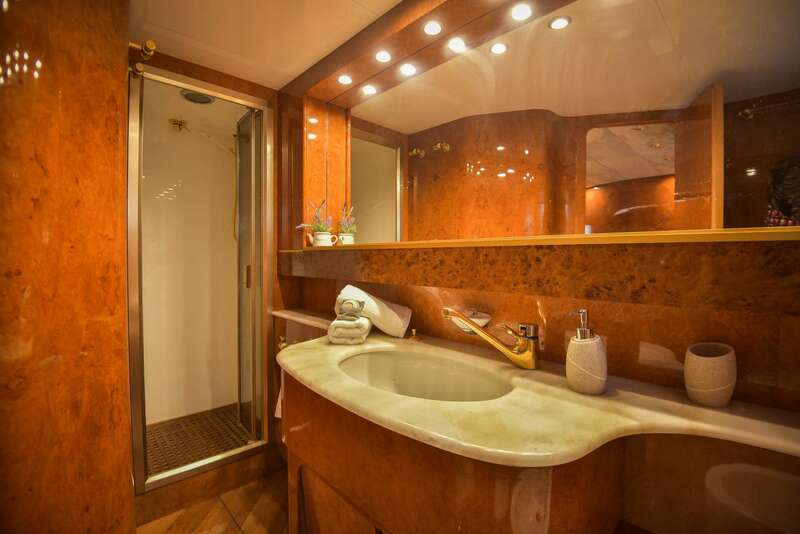 The professional crew of 4 will ensure that everything is taken care of throughout the cruise.